The CILAMCE (Ibero-Latin American Congress on Computational Methods in Engineering) launched in 1977, was convened in Compiegne and Paris, Nov. 12-14, 2018 for the first time in France. 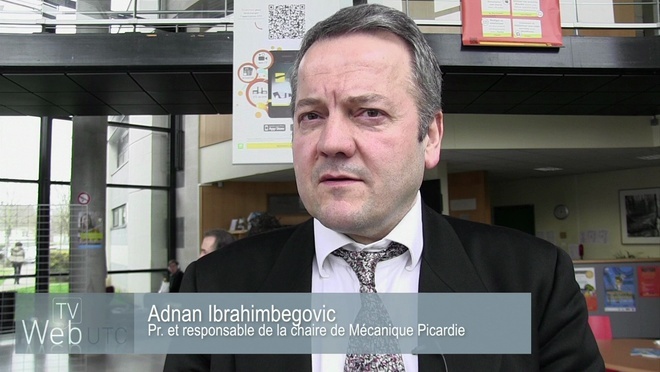 The ‘Master of Ceremonies’ was Professor Adnan Ibrahimbegovic, tenured holder of the Chair of Digital Computation at UTC and a Senior Fellow of the famous Institut Universitaire de France (IUF) since 2015. Is it because of his Bosnian origins – he hails from ex-Yugoslavia – that he perceives the dangers of isolation? The links between various specialties? Adnan Ibrahimbegovic was recruited by UTC to occupy the Chair of Computational Mechanics and, very early on in this post, he rapidly focused on the questions occurring at the interfaces between classic specialty fields. “And, no sooner you pronounce the word ‘interface’ than there arises a need to see different specialties dialogue together. In short, you need to instil and bolster interdisciplinarity, which it turns out is the only way to make progress in addressing and solving complex problems”, he stresses. The need for interdisciplinarity is self-evident for an ongoing research project at the UTC Roberval Lab: to discover if a CFRP (Carbon Fibre Reinforced Polymer) megastructure can resist operational conditions of extreme strain. “We have two long-term industrial applications to hand: one lies in designing giant, flexible 100 m blade wind generators, each producing 10 MW, i.e., the double of what already exists in Europe; the other lies in future wide-body high capacity aircraft”, details Adnan Ibrahimbegovic. Notwithstanding, there are some significant constraints and possible drawbacks to our projects. “Assembling a wind generator using a low density material; increasing the power output must also see compliance with structural resistance when faced with extreme storm (hurricane) conditions. Likewise, the wings of future wide-body aircraft will have to be able to withstand violent aerodynamic forces”, he adds. The question remains – how can we understand and solve problems when no test-rigs in the world enable you to reproduce extreme strains on structure this big? Here again there are forms of scientific collaboration, between the various specialties involved. At UTC, in the framework of the Labex MS2T, in relevant international circles and with the laboratory for advanced computation headed by Prof. Mathies Hermann, University of Braunschweig – Institute of Technology, Germany. “Our mechanical engineering, acoustics and materials lab (UTC –Roberval) is equipped to produce and assess CFRP test samples (each several centimetres long). Our research team first measures the resistance of these scaled down samples, taking special note of the variability of the measurements. The results we obtain are then analysed at the UTC applied maths lab (UTC-LMAC) and transposed to XXL structures”, details Adnan Ibrahimbegovic. The precise way in which two parts made from the same material crack or break differs as a function of their size. In order to quantify the scale effect here, we apply new probabilistic methods and that allow us to demonstrate the risk of catastrophic failure amplification processes on a 100m long item (each wind generator blade). If you want to engage in interdisciplinary approaches, you necessarily need to ‘decipher’ the codes specific to each research field, in order to explore new fields at the “fringe of basic research and applied research for applications. This calls for qualified engineers but also some PhDs. And the judgement I make is that we do not train enough of them. The answer, as I see it, will lie in recruiting more students, especially those with international outreach“, deems Professor Ibrahimbegovic.